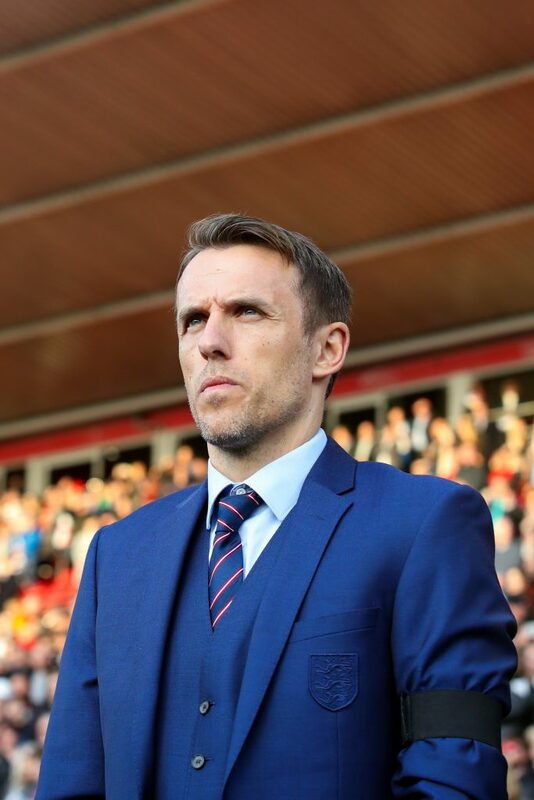 England manager Phil Neville didn’t get the result he wanted in his first competitive game in charge of the Lionesses and he was magnanimous in the face of frustration. 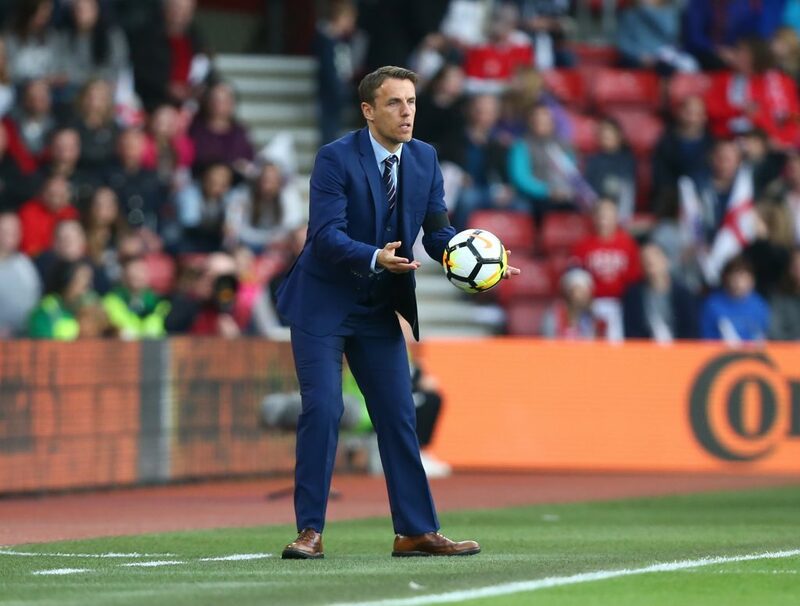 He praised the performance of Jayne Ludlow’s Welsh team as they succeeded in holding out for a goalless draw at the St. Mary’s Stadium, Southampton in the FIFA Women’ World Cup Qualifier on Friday night but he also had positive words about his own team’s second half display. “You sometimes get results like this in football,” he reflected in the post-match press conference. It wasn’t the result I was looking for. I wasn’t happy with the first half performance. I thought we were sloppy in possession, which is not like us. We trained really well all week. We didn’t play with any speed or intensity, we gave away careless passes and their game plan worked in the first half. In the second half I thought we were fantastic. We kept them penned in, in their half. We played with speed, we created 1v1 situations in wide areas, we were the only team that was looking to win the game but you’ve got to say that they defended unbelievably. There was a period in the second half when we were on top all of the time and I thought, ‘It’s going to take a scrappy goal,’ there was very little space for Jordan [Nobbs], for Fran [Kirby], and that’s why I made the substitutions that I did because I thought wide areas was the best option – going round them rather than through them – because it was like coming up against a brick wall. We’d said all week that the first goal was always going to be crucial because they would have to then change their game plan. Their plan was to sit really deep, on the edge of their box, five defenders, four in front and the centre forward up front (who worked her absolute socks off) and then look for us to make mistakes. And in the first half we made mistakes in possession, which gave them the little bit of feeling that they could try and nick one on the counter attack and they had the chance early on. Second half though, we dominated and we played all of the half in their half. It felt like a defeat. The looks on the girls’ faces, it does feel like a defeat because we were expected to win and our dominance should have meant that we should have won the game and what I said to them at the end was, that it’s probably going to be even worse in Bosnia. They’re going to play even deeper, the centre forward today for Wales – who I thought was fantastic – against Bosnia, I wouldn’t have thought they will even have a centre forward. They’ll just camp in with five [defenders] and five [midfielders]. So we’ve got to be better in the final third. We’ve got to show better composure and better quality. It’s a fantastic result for them [Wales] and you can see from the way they celebrated at the end. And that’s why it feels like a defeat for us because they were celebrating like it was a victory. We were the team that were dominant. I think even Jayne would admit that it felt like the goal was always coming but it didn’t come. Their keeper punched every set piece, they emergency defended really well and our girls got frustrated at times and it just wasn’t to be. It was a fantastic performance from Wales, as an opposing manager, you’ve got to hold your hands up and say that they played really well defensively. They doubled up…there was one point when I thought Mel [Lawley] had the better of the full back and two, three more girls came over to help her out – they showed tremendous spirit and we didn’t break them down. It wasn’t a surprise. They played a similar system in their games in March [at Cyprus Cup] and I think the key is always the first goal. When you are second in the world and there are a lot of nice things being said about you, maybe in the first half that was our mentality? That we just have to turn up? Yesterday they trained unbelievably and I had a really good feeling they were going to come out of the blocks quickly but sometimes expectation affects you and it did in the first half. But in the second half the effort, determination, right to the 94th minutes – the subs made a massive impact – my team were fantastic. I’ve not seen the incident. From where I was, I thought it was a goal. The BBC have told me it was inconclusive, so I’ll have to look at it again. It was their only shot on goal. I think it would have been very harsh on us if we had lost the game, I think that would have been an unfair result. From their point of view they would be happy with the draw. I didn’t see any fatigue in my players and I’ve not seen it all week. The players were well rested. They’ve not had to run much in this game, it’s not like they’ve had to go box to box, they were in one half of the field. So, in terms of energy, that’s not a problem. No, I didn’t ever think it was going to be easy. No-one hands you anything, you’ve got to work hard for it. I’ve had a feeling about this game all week. A Premier League ground, a big crowd and I have to say the crowd were unbelievable. They stayed right until the very end and the atmosphere was great. It was a really good game, even though it was 0-0 but it’s a tough job being a manager in football and to qualify for a world cup, you’ve got to earn that. We’ve got to go to Bosnia to play on Tuesday and we’ve got to earn the right to win that game. And if we play like we did in the first 20-30 minutes tonight we’ll struggle to win that game as well because Bosnia aren’t going to lay down and let us score two or three goals. There’s an inner determination but we’ve still got a lot of work to do. If you speak to the Welsh defenders they won’t have enjoyed playing against my team, they’ve worked so hard but you sometimes get results like this in football and we’ve just got to lick our wounds and return again on Tuesday. We’re not going to change the way we play, whatever the conditions or situation, we’re going to play football the way we played in the second half. I enjoyed watching us. There was a confidence to our play, it was just that final bit and the final bit is always the bit that you need to relax, maybe take the extra pass and have composure. We were just a little snatchy and that may have been that over determination to score. We will work on that on Monday. I felt we had a nice balance from set-pieces and corners. When I first took the role and at She Believes I wanted us to take short corners as I think we’ve got fantastic players, technically. Two or three of the routines worked, two or three didn’t but I think we have to persevere with the philosophy of playing football. It’s easy just to lump the ball in the box. I’ve been to 10-15 WSL games and I’ve never seen a goal scored from a corner. In terms of the stats, there are not many headed goals scored from corners in the women’s game and that’s the amount of depth that we’ve gone into it. So we’ve said, why chip the ball into the box and give them the ball back, why don’t we keep the ball by coming up with routines and we’ve challenged the players to do that. The easy thing in games like today, when there are 25,000 fans, is just to lump the ball into the box. I think we got a better balance in the second half of going into the box and going short. It’s something the players like doing, they all want to get on the ball and they all want to create that goal. I couldn’t believe the telling off [for helping Kayleigh Green with cramp]! [Laughs] I was trying to do a nice thing. I saw the centre forward, who had run a million miles, she was screaming in agony with cramp and I’ve been there and done that. Straight away, it’s natural, I know you’ve got to lift the leg and straighten and bend the toes back. The fourth official and the referee both came sprinting over and I felt like I was the baddie. I wanted her on the ball and she found it difficult in the first half. I slightly tweaked it after about 10-15 minutes and I put her closer to Jodie [Taylor] but then in the second half I reverted her back to where she’d played in the USA (where she’d played unbelievably well) in terms of finding spaces and getting on the ball. Jordan had to come really deep to get the ball because there were no gaps, they’d closed of all the space and when we tried to play the ball through it was like a wall. So it was a game where Fran would have felt frustrated but I told her in the USA that I want to play her in positions where I can get her on the ball because she’s a fantastic mover of the ball and when she plays well, we play well and I know she likes it. I know she plays higher up for Chelsea and at times we will play her higher up but at present this is the position where I see her best. I thought Beth Mead and Mel Lawley both made a brilliant impact when they came on – the directness of them both. They came on at a time when Wales were wobbling a little, physically. Beth would have gone to the She Believes Cup but she had a bit of knock before then, so she pulled out. She’s another one I’ve been impressed with. She’s a young player, I like speed in my team and what Beth and Mel have done now is they’ve created a challenge for places for those that are already in the team. Beth’s got a big future in this England camp if she continues her level of performance for Arsenal and what she’s done in the training with me. He’s right, it was a goal.